Setting up a Test Bench Iso-irradiance Charts Comparing Meters Problems? 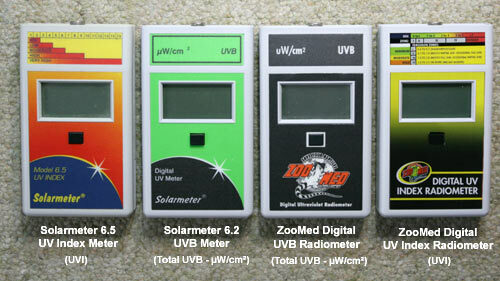 Fig.1 shows the range of UVB meters we use in all our tests. These meters are easy to use and we have found the readings to be consistent and reliable. The UVB meters are of two types: the "UVB Meter" which measures the total UVB across the entire wavelength range (280 - 320nm) in microwatts per square centimetre (µW/cm²), and the "UV Index Meter" which gives a reading with greater sensitivity to the shorter UVB wavelengths, responsible for vitamin D3 synthesis in the skin. To make life a lot simpler, the meters will simply be referred to as "Solarmeter 6.2" or "Solarmeter 6.5" in the following discussion. 1. Open top flap of leather carry-case to uncover sensor. 2. Aim the sensor at the light source. Do not touch the sensor or hold it against the surface of the lamp. 3. Press the on/off button below the LCD display. 4. Read LCD display, which gives the amount of UVB reaching the sensor in either µW/cm² (UVB meter) or UVI units (UVI meter). 5. Using very slow, small movements, tip the meter to scan for the best alignment - which will give you the highest reading on the display. This is the reading to record. To record the output of a lamp, hold the meter with the sensor at a specific distance from the lamp surface. We suggest that if only one measurement is to be taken, this is at the standard distance of 12 inches, or 30 centimetres. Lamps of the same brand anywhere in the world may only be compared easily if all recordings are made at the same distance from the lamp. We welcome your recordings to add to our database. 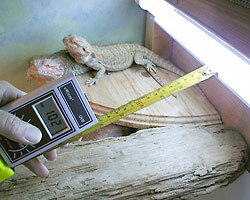 12" is a useful "standard" distance since it is often stated to be the maximum distance at which a standard reptile UVB fluorescent tube should be used, and several mercury vapour lamps are designed with this as the minimum recommended distance from the reptile. Some more powerful lamps have minimum recommended basking distances greater than 12". For these lamps we suggest that at the very least, a recording be made at their "recommended" minimum distance, as well. 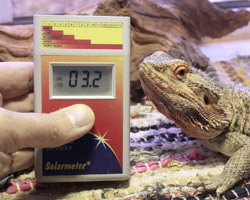 To find out the UVB your reptiles are receiving, hold the meter in the basking spot, so that the sensor is at the level of the reptile's back, aimed directly at the UV lamp. This meter was used in all our earlier tests, and is still claimed to be the most accurate hand held UVB meter on the market. This very instrument has been used in research into vitamin D3 synthesis at the Vitamin D, Skin and Bone Laboratory at Boston University Medical Center 19 and in numerous other research projects worldwide. This meter estimates the total UVB radiation falling on its sensor (it responds to wavelengths from UVC right up to and including a little short-wavelength UVA at about 330nm). It has very high precision - 1µW/cm² - so it is extremely useful for the monitoring of decay in any one lamp, and in measuring very low levels of UVB both in the field and in the vivarium. Its broadband response (typical of all UVB meters) to the entire UVB waveband, however, causes a problem if we want to compare the ability of different lamp brands to enable vitamin D3 synthesis, or to match up sunlight and lamp UV levels. Solar Vitamin D3 synthesis almost all occurs between 290 - 315nm, but the shorter the wavelength, even within this small range, the greater the effect. This is also why UVB readings from natural sunlight cannot be used as guides to "suitable" readings from a lamp in a vivarium. Natural sunlight has a far greater proportion of its UVB in the longer wavelengths. Most reptile UVB lamps have the exact opposite to this, with a higher percentage of their UVB in the more photo-reactive, shorter wavelengths. To put it crudely, their UVB is "stronger". This problem was highlighted when in 2006-7, certain fluorescent lamps with quite low UVB readings caused eye and skin damage in many reptiles 4. These lamps emitted extremely short-wavelength UVB; only small doses of radiation from these lamps could burn living skin very quickly. Fortunately for us, Solartech had launched the Solarmeter 6.5 UV Index meter. 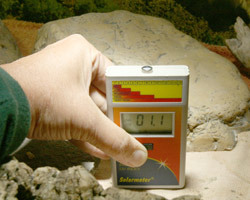 The UV Index meter created by Solartech (http://www.solarmeter.com/model65.html) performed extremely well in comparison trials with other UVI meters and a research-grade spectrometer 72. The UV Index (UVI) is an internationally-recognised, unitless measurement of the intensity of the photoreactive part of the spectrum of sunlight (or any light containing ultraviolet). It is often included in weather forecasts. It is based upon an integration of the spectrum of the sunlight (or lamp) with the action spectrum for human erythema, ie., sunburning 73. Of course this is totally irrelevent for reptiles and amphibians! ...but that action spectrum is very close to the action spectrum for vitamin D3 synthesis, which of course we ARE interested in. It's not a perfect overlap, but interestingly, the response curve of the Solarmeter 6.5 meter appears to follow the D3 action spectrum even more closely than it does the erythema action spectrum. It provides a good enough match, in fact, for the readings from Solarmeters with this sensor/filter combination to act as a proxy for the vitamin D3-producing ability of the light source 74. The match is very good indeed. We have calculated that the 6.5 meter's sensor response from two different years of manufacture (when inevitable differences between batches of sensors/ filters occur) were 96.0% and 93.2% matches, respectively, to the CIE pre-vitamin D3 spectrum from 290 - 400nm. This is impressive for a relatively inexpensive instrument. What this means is that although Solarmeter 6.5 UV Index meters are still broadband meters with, of course, the previously described disadvantages still applicable, the very specific sensitivity response negates most of their effects. Hand-held meters can never be "accurate" in the same way that a spectrometer can be. From a practical point of view, however, we believe that a Solarmeter 6.5 is more than adequate for matching the output of a lamp with a known, safe spectrum with that of sunlight, when setting up a UV gradient in a vivarium indoors. 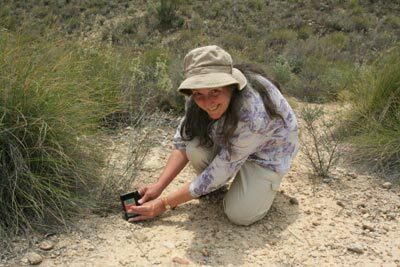 New recommendations for suitable UVB gradients in vivaria are being developed based upon field studies recording the UV Index in the microhabitat of numerous species in the wild. The pioneering work in this field was done by Dr. Gary Ferguson and his research team from Texas Christian University 75. This paper has been used as the basis for establishing what have been named the "Ferguson Zones" - a simple division of reptile and amphibian species into 4 "Zones" or "UVI ranges" based upon their basking behaviours and microhabitat, which together determine their daily UV exposure. 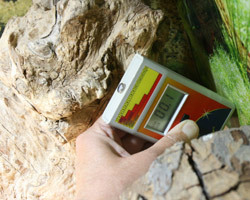 The Ferguson Zones have been used by the British and Irish Association of Zoos and Aquaria's Reptile and Amphibian Working Group's UV guide, now published in the Journal of Zoo and Aquarium Research 76 and have been added to the labelling and the instruction leaflet for the ZooMed UV Index meter 77. They are also appearing on some manufacturer's instructions for UV lighting products. Each of our new lamp test result files (coming soon) will contain a page with a simple guide to the Ferguson Zones. The meter is small, fitting easily in one hand, and is powered by an ordinary 9v battery. The sensor is at the top of the meter, and to take a reading, the operator simply aims the meter directly at the UV source and presses a button on the front of the unit. The amount of UV reaching the sensor at that moment is displayed on the LCD panel. 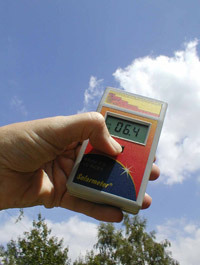 In the case of the Solarmeter 6.2, the readout is in microwatts per square centimetre (uW/cm²). If, for example, the reading was 023 uW/cm², this would mean that a square centimetre of reptile skin would be getting 23 microwatts of UVB at that point. The Solarmeter 6.5 readings are of the unitless UV Index scale. If, for example, the reading was 03.5, this means that the reptile skin would be getting UVI 3.5 at that point. The sensor is extremely sensitive, with minute changes in the angle between sensor and source causing variations in the readings. Logically, the highest readings will be seen when the sensor is most accurately aligned in the beam of light; when taking hand-held recordings, it is adviseable to "scan" for the best alignment with very slow, very small movements. With practice, lining up the sensor can be done fairly quickly and very accurately. When taking recordings, we always use the highest readings obtained consistently (i.e. on at least 2 to 3 "scans") on each occasion. What we have been able to do, with our hand-held radiometers, is to look at the UV output of the sun, and of any light source, and investigate in detail the initial output of a new lamp; the decay in the output of a lamp with time; and the characteristics of the UV "beam" for each type of lamp - how far the UVB light extends from the lamp and in what directions. Between us we have taken many thousands of readings both outdoors in natural sunlight and shade, and indoors from a wide range of UV products. The sections below describe the methods of recording we have found the most useful when using the meter outdoors (for solar recording), indoors in the vivarium, and on a simple "test bench". The page concludes with a short section on comparing different UVB meters, and a discussion of one or two problems which might be encountered when using the Solarmeters, along with their solutions. When taking solar recordings, never look directly at the sun. It is easiest to align the meter whilst facing the sun. Hold the meter out at a comfortable distance at just below shoulder level and "scan" carefully by tipping the meter towards the sun, searching for the highest reading. Readings need to be taken out in the open, where trees or buildings do not block a clear view of the sky. The sensor's field of view is a full 180° with a cosine response curve - this means that although it is most sensitive to whatever is directly in line with it (in this case, the sun), it will include diffused UVB from the sky around the sun in the reading. If this "sky" includes the dark silhouette of a building or tree, a lower reading will be obtained. Conversely, if there are large reflective surfaces such as water or snow beneath the sky, reflected and scattered UV from these may result in a higher meter reading. If taking a series of readings throughout a single day, ideally all the readings should be taken from the same spot, so that the readings are comparable one with another. It is also important to record the exact time of each recording. As the sun rises in the sky, the reduction in the thickness of atmosphere through which the light is passing causes an extremely rapid increase in UVB. We have recorded changes of a microwatt a minute. For example, between 7.30am and 8am on June 10th 2005, in Wales, UK, under a clear sky, the reading climbed from 40 to 70uW/cm². By 8.30am it was 105uW/cm² and by 9am it was 135uW/cm². When taking solar recordings, it's useful to note the weather conditions; in particular, if the sun is shining, is it in a clear, deep blue sky or is there high cloud or haze? The increase in water vapour in the sky due to these will reduce the UVB levels reaching the ground. If there is total cloud cover, direct solar recordings may not be possible. So-called "global" recordings usually give the highest readings with 100% overcast skies. To obtain these, the meter is held vertically, to record from the zenith (directly above the observer). When recording for a database, you may also wish to record the location (latitude and altitude) at which the recording was made. If your country is using Daylight Saving Time this too needs adding to your report; and remember, if so, the sun will reach its highest point in the sky, and UVB its maximum level, around 1.00pm Local Time rather than at noon. Fig.4 shows recordings made with a Solarmeter 6.2 during the course of one clear day in August in Wales, UK. Faint high cloud and haze in front of the sun has caused slight "dips" in the graph at various times but the pattern is distinctive. More details on solar recordings, and the ongoing Solar Recording Project, are in our feature UV light in nature and in the files section of the UVB_Meter_Owners internet mailing group. 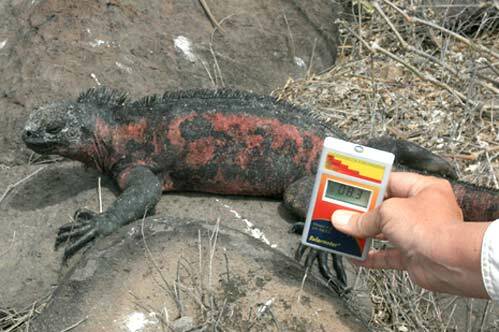 Fieldwork: Recordings of UV "where the reptiles are"
One of the most exciting uses of your meter - and the most important - is to make recordings of the UV actually experienced by a wild reptile or amphibian in its native habitat. When you do this, there are a few important things to remember. First of all, don't frighten the animal or disturb it: keep your distance - you do not need to hold your meter next to the animal! This is not just un-necessary and likely to stress a wild animal, it could be dangerous for you; it is also illegal to disturb protected species, in many areas. Observe the animal's position carefully and wait until it has moved well away from that spot, then go to that spot, and take your reading from that exact position, at animal level, aiming the meter sensor towards the sun or sky, i.e., scan for the highest reading. When you are taking the reading, if possible stand, or crouch, behind the meter (see Fig. 5) and make certain you are not blocking the sensor's "view" of the light, as this will result in a falsely low reading. It's helpful to take a "full sun" solar reading, for comparison, as soon as possible after your reading at the animal's location. Look for a nearby area in full sunlight and take this reading as described in the previous section. This will nearly always be higher than the reading at animal level, because animals are usually at least partially sheltered by foliage, rocks etc. in their microhabitat. Don't forget to make a note of the time of day, and the location of the animal. You might want to add details of the weather, the temperature and describe what the animal was doing (basking, foraging, etc.). Do consider compiling your records and contributing to a database or an online forum. The UV in the microhabitat of most species is still unknown! UV Index recordings are especially helpful as it is easier to relate these to readings taken from lamps in the vivarium. Safety Precaution: Always wear eye protection when studying UV lamps. However careful you are, it is very difficult to take recordings without looking directly at the lamp, especially when measuring the distance from the lamp to the meter. Look for glasses which state clearly that they offer 100% protection from UV light. Whereas some fluorescent tubes, for example, emit (at 12" distance) less UV light than is reflected by sunlit trees and grass, and are thus unlikely to cause harm, some mercury vapour lamps, at 12" distance, emit as much UVB as the sun at the centre of their beam. Intense visible light may also damage your eyes. Even when wearing glasses, avoid staring directly into any very bright lamp, whether or not it emits UV, at close range. More accurate recordings, at known distances from a lamp, are taken using a meter and a steel tape measure, ruler or measuring stick. The end of the tape measure is positioned at the surface of the tube or face of the lamp, and the meter is positioned so that the sensor is at the required distance from the light. This is the best way to monitor lamp decay. Because the tape measure or ruler will inevitably block some light from the sensor, it must be moved away before the reading is taken. This manoeuvre takes a little practice, as the meter must remain at the correct distance while the tape measure is removed. With fluorescent tubes, the highest readings will be found when the meter is positioned perpendicular to the axis of the tube, half-way along its length. With lamps and bulbs, the beam is usually focused by internal reflectors and although, in general, the highest readings are found directly in front of the lamp face, this cannot be relied upon. Often, the beam is at a slight angle from the perpendicular owing to minute discrepancies in the alignment of the arc tube, glass envelope, etc. The path of the UVB beam usually closely follows that of the visible light and this can be used as a first step in aligning the meter within the beam; thereafter, careful scanning (in the same way as previously described for a solar reading) will locate the "hot-spot" at the chosen distance. 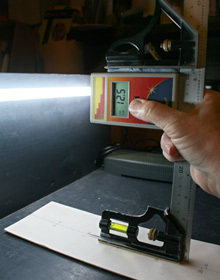 Fig.9 shows a steel tape measure being used to take a reading from a fluorescent tube fitted with a reflector. (The meter is one of the first Solarmeter 6.2 meters brought into the UK - early versions had black labels.) First the meter is positioned at the required distance (in this example, 6 inches). Next, the meter is switched on and moved around a little, at that distance, whilst scanning for the maximum reading (i.e., aligning the meter). Then, the tape measure is moved out of the way, a final alignment made and the reading taken. In this example, the reading increased from 102uW/cm² to 105uW/cm² with the removal of the tape measure. Sets of readings may be taken from each lamp tested, at increasing distances from the lamp, to give an indication of how far the UVB penetrates into the vivarium. If readings are repeated at intervals (for example, once a month), the decay of the lamp throughout its lifespan may also be recorded. If there is more than one UV source in a vivarium, don't forget to switch off the one you are not recording from, or it will affect your results. Watch out for metal reflections in the vivarium. UVB is hardly reflected at all from glass or perspex, which absorbs the rays. Glass mirrors likewise reflect almost no UVB. However, bare metal surfaces such as polished or brushed aluminium reflect UVB strongly. You may obtain false high readings from a lamp if the sensor picks up UV from the lamp's reflection in a metal surface. 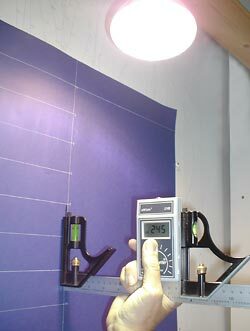 If you want to take your study further, you may wish to set up a simple test bench for the rapid, accurate measurement of the UV output of your lamps. New lamps can be burned-in whilst on the bench, making it easy to repeat daily measurements precisely. Lamps on long-term testing can be temporarily removed from the vivarium and placed on the bench for individual tests, as well. A simple test bench for fluorescent tubes and compact lamps is easily constructed on a table top or work surface. Fig. 10 shows recordings being made from a fluorescent tube. The work surface is dark, to reduce reflections. A measuring line has been drawn on card placed so that the zero for the measuring line is at the surface of the lamp. Compact lamps may be place in simple lamp-holders positioned at the end of a measuring line, in the same way. To make life easy and eliminate the need for a tape measure, the UVB meter has been temporarily attached to a set square such that a pointer fixed to the base of the square, resting on the measuring line, indicates the position of the sensor directly above it. The distance from the tube to the meter sensor can thus be measured accurately without a tape measure. The meter is held steadily against the set-square using blu-tack while it is moved along the measuring line, enabling rapid recording of a set of measurements with no errors due to hand-shake. A further development to the recording of the output of a lamp in this simple linear style, is the production of an iso-irradiance chart. This is a two-dimensional map of the shape of the beam, constructed by plotting the UV gradient under the lamp (e.g., Fig.12). Charts for each type of lamp are featured in the Lighting Survey reports. All our UV data has been compiled from readings taken with the Solarmeter 6.2 and 6.5 meters or their ZooMed equivalents. These Solarmeters are individually calibrated by Solartech, by reading transfer from a standard meter calibrated to NIST standards. They are claimed to be accurate to at least ±10%. We have tested a number of meters together, and have found that individual meters are reasonably consistent with each other in the readings they give from the same light source (as demonstrated in fig. 13 with models of the Solarmeter 6.2 and the ZooMed UVB meter). The Solarmeters run off a standard 9-volt DC battery which may, according to the manufacturer, last for about two years of "normal" use. Battery operation voltage is 9V down to 6.5V. Below 6.5V the LCD numbers will begin to dim, indicating the need for battery replacement. The readings remain accurate until the numbers begin to dim. The meters are sensitive to excessive humidity and heat. If the meter is stored or used in a very hot or humid situation, there can be a temporary false elevation of the reading by several units. This is easily detected, as the meter will not read "zero" with the cover over the sensor, but give a reading of a few microwatts or UVI instead. Allowing the meter to cool or dry out will resolve the problem. In very humid environments, such as rainforests, the manufacturer suggests storing the meter in a plastic bag with a sachet of silica gel. When testing a high-wattage lamp, at close range the meter may be affected by the heat. Our tests using two 100 watt mercury vapour lamps showed that even as close as 4" from the lamp surface, provided the readings are taken within 1-2 minutes there is little or no effect upon the reading. Longer exposure to heat does cause a slow artificial rise in the readings as the front of the meter gets hot. A change in temperature from around 21-22°C, to around 44-50°C produced a change in readings from 1 - 6uW/cm2 in a set of 4 experiments with a Solarmeter 6.2 - a change of between 2-6%. It is worth bearing in mind that readings taken close to lamps should therefore be taken fairly rapidly, within maybe a half a minute or so, as holding a meter close to a hot bulb for any length of time will cause a slow false rise in the readings as the sensor is heated. The meter sensor should not be touched or held against the surface of a lamp. Contact with any solid object can produce minute electrical fields which create brief false readings. More seriously, contact with the extremely hot glass of some incandescent or mercury vapour lamps could easily damage the sensor.